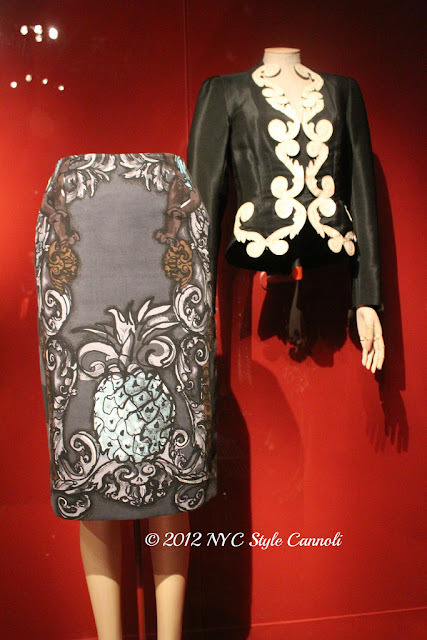 "Waist Up/Waist Down" looks at Schiaparelli's use of decorative detailing as a response to restaurant dressing in the heyday of 1930s café society, while showing Prada's below-the-waist focus as a symbolic expression of modernity and femininity. An accessories subsection of this gallery called "Neck Up/Knees Down" showcases Schiaparelli's hats and Prada's footwear. Be sure to check out the exhibit at the Metropolitan Museum of Art by August 19, 2012. That cupcake blog is super cute. Thanks for the intro. Love the printed pencil skirt.